Chocolate (and also caffeinated foods/drinks) contain alkaloid chemicals called methylxanthines. These pack a punch when consumed by your dog. They cause a laundry-list of possible ailments, some of which being vomiting, diarrhea, seizures, excessive thirst, and abnormal heart rhythms. The darker the chocolate, the more of these harmful chemicals you get. Grapes are known to commonly cause acute kidney problems and even kidney failure in dogs, so don’t risk feeding them raisins or grapes. Be mindful if you share food with you dog. Many dogs enjoy eating nuts, but make sure to remove the raisins if you reward your pooch with a handful of trail mix. A compound in onions prompts the breakdown of red blood cells in dogs, and can lead to anemia in some cases. 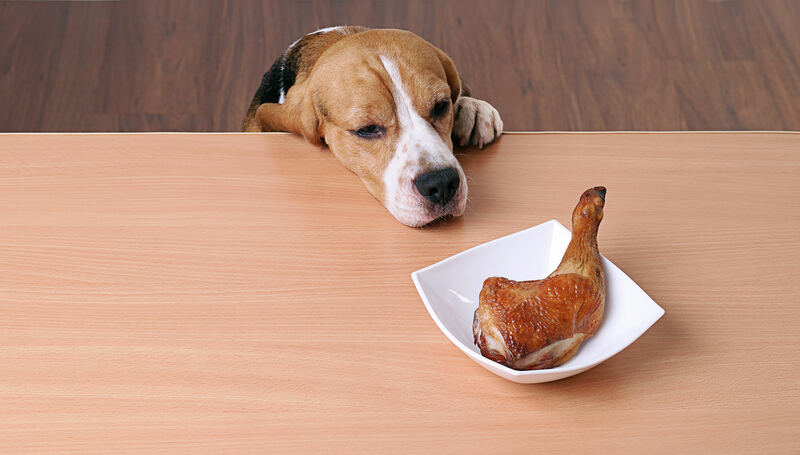 This can be tricky if you break off a piece of hamburger or leftover steak to reward your pup. Be mindful of onions mixed in with the meet! This may be counterintuitive given the loving relationship between dog and bone, but cooked bones become weak, and commonly splinter after consumption. These splinters harm the stomach and intestines of a dog. Also avoid small bones like you would find in chicken or turkey. Certain varieties of sugar-free chewing gum and candy contain the artificial sugar substitute known as xylitol. This compound causes a surge of insulin in dogs, and in the worst cases of ingestion, will shut a dog’s liver down. This list is the tip of the iceberg, containing only some foods that are toxic for dogs. Luckily, though, there are many foods your dog should eat and will enjoy. Do a little research, and find healthy treats to keep your pet from rummaging through the bad stuff!